For electrical safety reasons, it’s good to know how old your home is, it is recommended you have an electrical safety inspection if your home is more than 20 years old. Older homes weren’t built to handle the electrical load our contemporary lives carry. Knowing whether your home’s electrical system has been updated to safely handle all the electrical current your family uses is imperative. These guys are your friends, even though you may find their interference irritating when they trip and shut off your lights. They’re trying to tell you something, and it’s usually that you have too many appliances or gadgets connected to the same circuit. 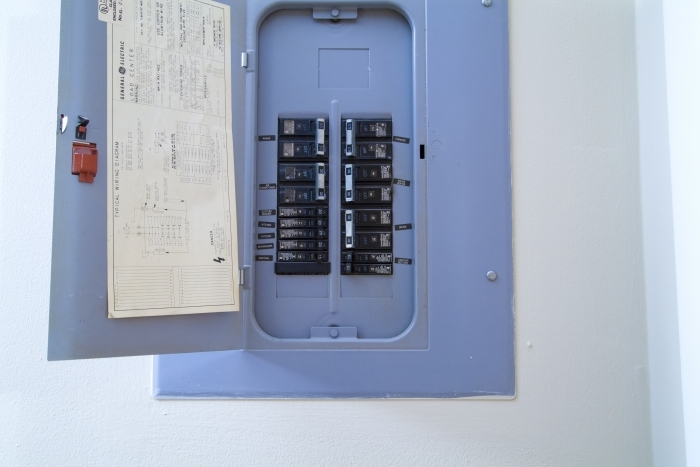 Reconfigure your appliances, and if the breakers keep tripping, get help from an electrician. Place your hand on the outlet plates in your home. A warm or hot outlet point to trouble. Older appliances could have grounding issues that might put you at risk for a shock. Ensure all your appliances have three-pronged plugs that can properly connect to a grounded outlet. Any kitchen appliances with just two-pronged plugs should be replaced. If the outlets aren’t grounded, they should be replaced, and a new circuit should be installed. Avoid using extension cords for long periods of time. Extension cords are great for temporary jobs, but if you are using an extension cord as a permanent source of power you might want to think about calling an electrician and having an outlet installed. If you have small children or are planning on having any kids soon, make sure that you have tamper-resistant receptacles. Children are incredibly curious in nature and part of that curiosity is seeing what happens when they stick something into an electrical outlet. TR receptacles are equipped with spring-loaded shutters that help protect your children from being electrocuted. Both springs must be pushed in for there to be any contact with electricity. The average cost of installing these is about 50 cents, which is a small price for electrical safety. Above All Else! Cut off the power before any electrical work is going to be done! One of the basics of electrical safety is cutting off the power at the circuit-breaker box before working on anything electrical. This really is the only way to ensure that there is no power going to whatever it is you are working on. Trust me; the last thing you want is to hit a grounded wire when you think there is no power. Electrical Safety is one of those things that every homeowner should follow. Unless you’re a confident, experienced DIYer, any electrical repairs should be left to an expert.